Applied DEM was formed as a division of Overland Conveyor Co (OCC) of Lakewood, CO, USA in 2005. Its mission is to help engineers utilize the power of Discrete Element Modeling (DEM) in solving bulk and particulate material handling and processing problems. When OCC was founded with the intention of developing advanced technology for the belt conveyance industry, Discrete Element Modeling (DEM) was on our mind. Even before the company started, we were introduced to DEM and numerical modeling of bulk materials flow by Dr Graham Mustoe of the Colorado School of Mines just down the road in Golden, CO, USA. Dr Mustoe had been helping to develop this technology since its beginning. One of his graduate students, Andrew Hustrulid was utilizing DEM in his PhD program. Although the technology was still new and was not yet being widely used as a practical engineering tool, it was obvious from the first application at Twentymile Coal Co. that this was what the conveyance industry needed to help design bulk material transfer chutes. "During the initial LW mining of the 1Southwest panel, TCC was experiencing spilling problems at the South Mains to West Mains transfer due to a material deflection issue. At the same time, Dr. Andrew I.Hustrulid was developing the first Discrete Element Model (DEM) to evaluate the flow of material in transfer stations4. TCC worked with Dr. Hustrulid and Overland Conveyor Co to apply his DEM to this transfer (Figure 18). The model provided simulations that were very similar to what was occurring at the transfer chute. Dr. Hustrulid made changes to the transfer chute in the DEM program to correct the spilling problem in the software simulations. These same changes were then applied to the transfer chute, which correct the spilling problem. Based on the success of Dr. Hustrulid’s program, it was apparent that the program could be used for numerous applications. Not only could it be used to evaluate a chute design in terms of preventing spilling, it could be applied to design the chute angles to eliminate turbulence, which would in turn reduces chute wear and dust liberation. The DEM could also be used to optimize chute design to insure that material loads on the belt with minimum turbulence, thus reducing belt cover wear and skirtboard wear." From this point forward, the use of DEM simulations in belt conveyor transfer design grew rapidly. But the technology was still a high end consulting tool which took time and cost more than engineers were sometimes willing to pay. From 1996 to 2003, DEM was used mostly to solve existing problems with transfers that effected mine performance. When a problem could be physically identified and documented, DEM and particularly the difficult part of characterizing complex bulk materials mathematically could be verified. And once DEM could simulate the problem, it could be used to provide the solution. Finally, a technology was available to engineers to help prove a design before cutting steel. The days of field fit and field modifications to fix the numerous flow and plugging problems of bulk material transfers was potentially in the past. In 2003, OCC’s Chute Analyst™ program became the first commercially available DEM engineering tool available to all belt conveyor designers and engineers. Engineers around the world began this era of engineering analysis of bulk material flow. Recognizing the significance of DEM technology and realizing its potential use in many, many other applications other than belt conveyor transfers, OCC created “Applied DEM” in 2005. 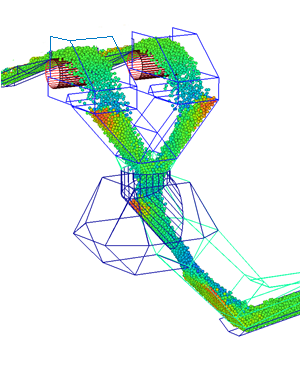 And in 2008, Bulk Flow Analyst™, a general purpose program for simulating material processing and flow applications in any industry was released.